Female soccer players playing elite or select soccer before high school sustained concussions at a rate higher than their high school and college counterparts, most continued to play despite experiencing symptoms, and less than half sought medical attention, a first-of-its-kind study finds. players who were evaluated by a qualified health care professional (e.g. physician, nurse practitioner, physician assistant, or certified athletic trainer)(QHP) were symptomatic significantly longer (11.5 days versus 2 days) and less likely to play with symptoms (42.3% versus 71.9%) compared with those who were not evaluated. players who did not continue playing with concussion symptoms cited concern for making symptoms worse (39.0%) and advice from a health care professional (25.8%), parent (35.6%), or coach (28.8%). The study's authors offered several possible explanations for the concussion rate in female middle school soccer players four times higher than in the most recent study of female high school soccer players. They could be explained, said lead author, John O'Kane, MD, of the University of Washington Sports Medicine Clinic, by differences in methodology (prospective data collection with weekly interviews in the current study versus data reported by athletic trainers in the other studies), and under-reporting in previous studies that captured concussions only in athletes seeking medical attention. Noting other studies finding that between one-third and one-half of players report concussion symptoms for which they did not seek medical attention, and the fact that, in the current study, only 44.1% of athletes identified through the weekly interviews sought medical evaluation by a QHP, and that the concussion rate considering only those diagnosed by a QHP was far lower than the overall rate reported (.4 per 1,000 AEs versus 1.3 per 1,000 AEs). "We suspect that underreporting in previous studies explains the lower rates observed," said Dr. O'Kane. "The fact that 58% of athletes continued to play with their concussion symptoms is troubling," said Tracey Covassin PhD, ATC, and Associate Professor and Undergraduate Athletic Training Program Director at Michigan State University, and an expert in sport-related concussions; "not from a research perspective but from an educational perspective and safety concern for the athletes. I feel like we are trying to educate athletes on the signs and symptoms of concussion and dangers of playing with a concussion, but either we are not reaching everyone (which is true) or athletes are continuing to hide their symptoms so they can continue to play." While O'Kane said there was some evidence that concussion education could improve the percentage of athletes reporting concussions, pointing to a 2012 study finding that high school athletes receiving concussion education were twice as likely to report symptoms to coaches compared with those with no education (72% vs. 36%), he acknowledged that a 2013 study (also by researchers at the University of Washington) found that many high school soccer players, despite understanding the symptoms of concussion and the potentially severe complications from playing with concussion, would continue to play despite symptoms. Conversely, the number and rates of concussions might have been underreported because the Internet surveillance system utilized required parents to be aware of their daughters' symptoms to be able to report them, although O'Kane pointed out that the surveillance system used had been shown in a previous study to be equivalent to the High School RIO, the certified athletic training reporting system used to track concussions in high school athletes. It was also possible, he said, that concussion symptoms may have resolved while an objective assessment (such as of balance, or neurocognitive function) might have revealed persistent deficits. (Indeed, studies have shown that self-assessments by athletes of recovery may be unreliable). "I think the biggest limitation with the study was that parents reported their child's concussion," said Dr. Covassin. "However, due to the parent not being qualified to diagnose a concussion, I think the prevalence and injury rate would have been higher if they had a certified athletic trainer present for practices and games." "I have great respect for the researchers at Harborview and think this was a good study, and was great to see somebody providing data on youth younger than high school age," said Dawn Comstock, an epidemiologist at the Colorado School of Public Health who has studied extensively sports injuries at the high school level. "That said, Comstock said that, as with all studies, there were a few methodological issues. "First, this is relatively small regional sample from a population with which this group has done quite a bit of work, so these parents may be more knowledgeable about concussions than other parents across the country." Second, like Dr. Covassin, she noted that it was based on a parent report of concussion symptoms, with about half of the reported cases never diagnosed by a medical professional. As a result, Comstock said, while the authors discuss the possibility of under-reporting in other studies, she was "more concerned with over-reporting in this study." Finally, she noted that "the researchers never tell us how many of the heading-related concussions were from athlete-athlete contact versus contact with the ball versus contact with the ground. "This is disappointing, Comstock said, "since they had the data and just didn't present it," an omission that she felt was was "really important from a prevention standpoint: if we want to significantly reduce concussions in youth soccer, [we need to know] do we need to ban heading altogether, or would we be successful if rules prohibiting athlete-athlete contact during heading were enacted and strictly enforced?" In the final analysis, says Dr. Covassin, the current study "demonstrates three things: First, we need to conduct better education for the younger population on the signs and symptoms of concussion. Second, we need to do a better job on educating players on the dangers of playing with a concussion, especially in this younger population. And, third, we need to conduct more research on youth athletes (5-13 years old) and female athletes." 1. O'Kane J, Spieker A, Levy MR, Neradilek M, Polissar NL, Schiff MA. 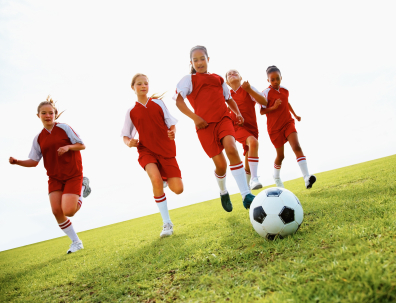 Concussions Among Female Middle-School Soccer Players. JAMA Pediatr. 2013;doi:10.1001/jamapediatrics.2013.4518 (published online January 20, 2014). 2. Marar M, McIlvain NM, Fields SK, Comstock RD. Epidemiology of Concussions Among United States High School Athletes in 20 Sports. Am J Sports Med 2012;40(4):747-755. 3. Meehan W, d'Hemecourt P, Comstock D, High School Concussions in the 2008-2009 Academic Year: Mechanism, Symptoms, and Management. Am J Sports Med. 2010; 38(12): 2405-2409 (accessed December 2, 2010 at http://ajs.sagepub.com/content/38/12/2405.abstract?etoc). 4. Chrisman SP, Rivara FP, Schiff MA, Zhou C, Comstock R.D. Risk factors for concussive symptoms 1 week or longer in high school athletes. Brain Injury 2013;27(1):1-9. 8. Bramley H, Patrick K, Lehman E, Silvis M. High school soccer players with concussion education are more likely to notify their coach of a suspected concussion. Clin Pediatr (Phila). 2012;51(4);332-336. 9. Chrisman SP, Quitiquit C, Rivara FP. Qualitative study of barriers to concussive symptom reporting in high school athletics. J Adolesc Health 2013;52:330-5 e3. 15. McCrea M, Hammeke T, Olsen G, et. al. Unreported concussion in high school football players: implications for prevention. Clin J Sport Med. 2004;14:13-17. 16. Dziemianowicz M, Kirschen MP, Pukenas BA, Laudano E, Balcer LJ, Galetta SL. Sport-Related Concussion Testing. Curr Neurol Neurosci Rep 2012 (published online July 13, 2012)(DOI:10.1007/s11910-012-0299-y). 17. McGrath N. Supporting the Student-Athlete's Return to the Classroom After a Sport-Related Concussion. J Ath Tr. 2010:45(5):492-498.